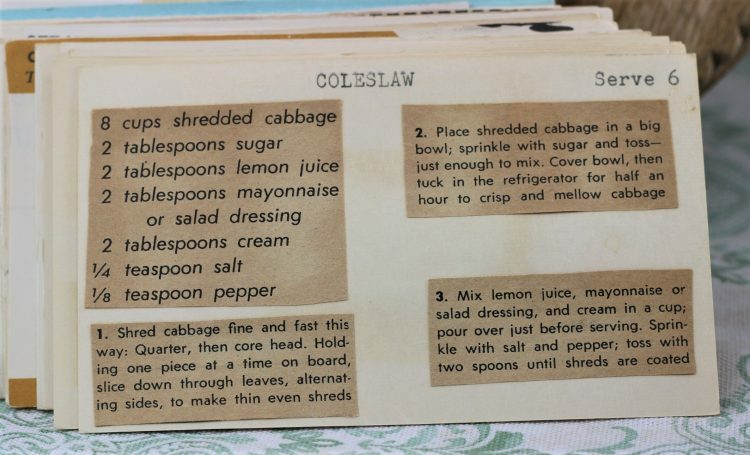 Front of the recipe card for Coleslaw. 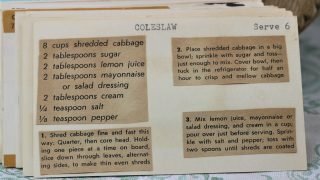 There are lots of fun recipes to read in the box this recipe for Coleslaw was with. Use the links below to view other recipes similar to this Coleslaw recipe. If you make this Coleslaw recipe, please share your photos and comments below! Holding one piece at a time on board, slice down through leaves, alternating sides, to make thin even shreds. Place shredded cabbage in a big bowl; sprinkle with sugar and toss - just enough to mix. Cover bowl, then tuck in the refrigerator for half an hour to crisp and mellow cabbage. Mix lemon juice, mayonnaise or salad dressing, and cream in a cup; pour over just before serving. Sprinkle with salt and pepper; toss with two spoons until shreds are coated.